6:01 p.m. — Welcome to the SkoDucks LiveBlog. The Ducks are in Tempe, I’m mired in Eugene and the hiatus is over. I like Oregon’s white uniforms. It’s kinda like the yin to the blackout ASU yang. Thus far, it’s an aesthetically pleasing game. 6:04 p.m. — After a brief hiatus, the SkoDucks LiveBlog is back. And things are not looking good. A nice kick return by Keenan Lowe was negated when our very own wunderkind, Marcus Mariota’s, first hand-off attempt on a read-option gets blown up in the backfield, ASU forces a fumble and then Taylor Kelly tosses a touchdown pass on his first play from scrimmage. Exactly how Chip drew it up. Oregon 0, Arizona State 7, 14:11 to play. 6:08 p.m. — Mariota misses Huff, who was wide. The. F@#$. Open. 6:09 p.m. — But Call on Kenjon, my favorite Thursday night program at the moment, decides to make everything alright with a 71-yard touchdown. Go for two? Why not. Oregon 8, Arizona State 7. 13:48 to play. 6:16 p.m. — So this Arizona State team is kind of good. Or as Jesse Palmer says, “They’re full of eye candy.” Odd Jesse. But not so odd, Dion Jordan. Lining up as an up-lineman, Jordan just blew past the pass protection and spiked Taylor Kelly into the Tempe turf, which led to a missed 43-yard field goal, pushed right by a poor chap by the name of Alex Garoutte. Oregon ball. 6:18 p.m. — I got the timestamp: Kenjon Barner is too fast for this ASU defense and he’s going to run for 200 yards tonight if he gets 20 touches. Claiming it. Double stamped, no erasies. DAT’s second touch ends much better than his first (which ended in the hands of ASU), but his third looked like his first and that’s bad. 6:22 p.m. — Mariota has got to cut it out. He’s one more fumbled hand-off away from Bryan Bennett appeals to start prematurely flooding Twitter (and this page as well, Dammit). Kenjon Barner might be playing the Fixer tonight, but Mariota’s reckless decision-making doesn’t bode well for the short-term future of the offense. 6:26 p.m. — Rece Davis has let us know that the “A” is no longer green. 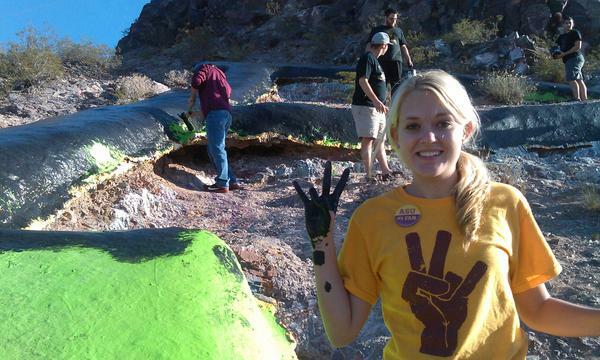 The ASU students have sort-of-rectified this weekend’s most collectively embarrassing moment for any college in the country by painting the green “A” black. Bummer. 6:28 p.m. — Note the time, because that might be the first time that Colt Lyerla, a.k.a. Spike Hammersmith, has been stuffed like that all season. 6:29 p.m. — Mariota! On 3rd and 4! To Bralon Addison! Over the shoulder! Right in the basket! Touchdown! More exclamation points!!…!!!!! Oregon 15, Arizona State 7. 6:39 p.m. — Mariota’s scrambling ability > Mariota’s hand-off ability. Ducks inside the 40. 6:41 p.m. — “Here comes the Blue Crab, it’s deadly,” — Jesse Palmer. Thanks Jesse. Oh, and Kenjon Barner has 120 yards and a touchdown on 7 carries. 6:43 p.m. — We might be watching Mariota growing up right before our eyes. The young QB checked down into after the defense showed house blitz, then completed a pass that left Oregon on the ASU one. Barner punched it in two plays later, but the refs decided to review the play in between. This is the second time Oregon has had a touchdown negated by a review of the prior play. It has to be some kind of record. 6:48 p.m. — Wow. Just… wow. Bryan Bennett, after a very strange miscommunication with Colt Lyerla in the backfield, flips the ball to Mariota (yes, 2 QBs on the field) for the touchdown. What a play. Oregon 22, Arizona State 7, 1:11 to play. 6:54 p.m — End of the first quarter, Oregon 22, Arizona State 7. Barner has been unreal, rushing for a touchdown (should have been two) and 130 yards on just 13 carries. Mariota has thrown for 32 yards and a touchdown on 5 of 7 passing, and rushed for another 46 yards on six carries. Oh, and Mari-OH-Tah has also caught a touchdown. DAT hasn’t really been a factor. 6:56 p.m. — First play of the second quarter and LB Boseko Lokombo picks off a lazy Taylor Kelly pass and almost returns it for a touchdown. But KB finishes the job with his second touchdown of the night. Oregon 29, Arizona State 7. 14:04 to play. 7:00 p.m. — That last interception thrown by Taylor Kelly was his first pick in 103 attempts, since his two picks in ASU’s Week 3 loss to Missouri. In case you were wondering. 7:07 p.m.— Say it with me! Mari-OH-Tah!!!!!!!!! Can you say 86 yards to the house? Mariota can, could probably do it in like 14 languages too. He was that impressive on that run. Just wow. In less than 18 minutes of play, Mariota has run for a touchdown, thrown a touchdown and caught a touchdown. Again, just wow. Oregon 36, Arizona State 7, 12:26 to play. 7:09 p.m. — And then Avery Patterson almost returns his second pick for a touchdown in two weeks, only to get stuffed on the two. I half expected Chip to run Patterson back out there to claim his TD. Instead, Barner picks up his third. Heisman… Heisman… Heisman… Oregon 43, Arizona State 7, 11:11 to play. 7:18 p.m. — Avery Patterson drops a hammer. What a hit. I have no idea if we are still allowed to get excited about hits like that, but I just did. It looked clean, and he decleated that poor Devil. Huck it, Chuck it, Foo’balll. All night. 7:23 p.m. — Hold on everyone. We got a rare Oregon Special Teams sighting. Jackson Rice makes his way out on to the field for the first time this game. 7:26 p.m. — The Booth is talking about it now, but I totally agree. This offense is going to get a lot of the credit for this game, as they should, but this defense has been playing at a ridiculous level. Nick Alioti has this team caffenated to the hilt, and the packages flying at Taylor Kelly might as well feature four-foot tall, helmet-clad green men carrying Phaser Guns because it looks that foreign to the kid. 7:32 p.m. — Oregon has 324 yards through 27 minutes. On the ground. 7:39 p.m. — What a first half for Oregon. It was aweso… Why is Lyerla limping into the lockerroom?!?!?!?!??! Please no. 7:40 p.m. — First half takeaways: Oregon is much better than ASU, and maybe, just maybe, much better than everyone thought. Halftime Stats Update — Kenjon Barner: 137 yards and 3 TDs on 14 carries. Marcus Mariota: 38 yards and 1 TD on 8-for-11 passing; 140 yards and a touchdown on nine carries; one reception for two yards and a touchdown. De’Anthony Thomas: 20 yards on 10 carries; 3 receptions for four yards. Oregon 43, Arizona State 7. Halftime. 8:01 p.m. — And we’re back. College football overtime > NFL overtime. College football halftime < NFL halftime. 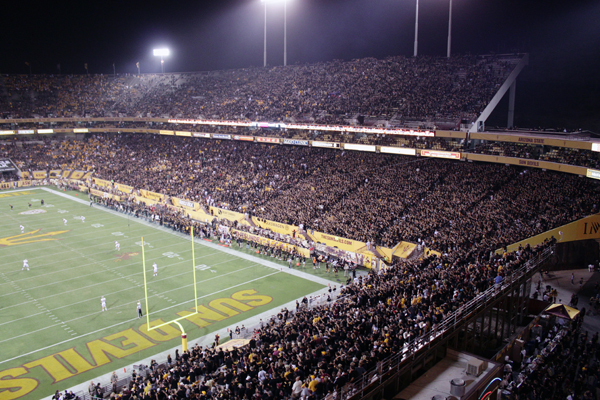 8:02 p.m. — ASU already facing a third and long. Good start for Todd Graham’s bunch. Three-and-out, ASU. 8:03 p.m. — DAT time? Nope. But Bryan Bennett is in now, and not in the Lylerla package so it likes like Mariota is done for the night. Speaking of Lyerla, still no Colt. I expect to see him in civvies on the sidelines soon, though. 8:06 p.m. — This is new: Competing three-and-outs. Something is afoot. And Rob Moseley of the Register-Guard is reporting that Lyerla is still in pads. Civvies prediction proved false in a hurry, but I can’t win ’em all. Huck it, chuck it foo’ball. 8:12 p.m. — Taylor Kelly just punted for the Sun Devils. I can’t tell if this was by design or if he just panicked. Just kidding. He totally panicked. 8:18 p.m. — The Duck looks bored. Or tired. 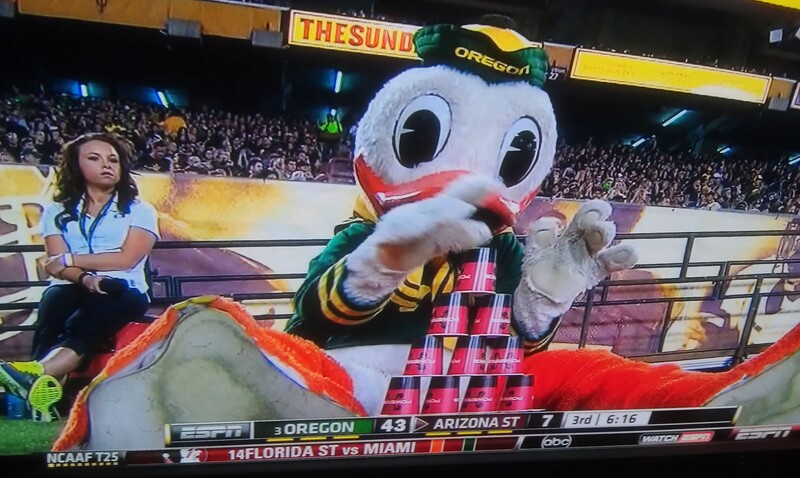 He did have to do 153 pushups in the first half, he deserves to stack some cups if he wants to stack some cups. Poor Puddles. 8:22 p.m. — Samantha Steele is telling us at home that DAT wants to race Tavon Austin in the 40. I would pay to watch that. In fact, I think that a race between those two would immediately move to third place on my Dream Head-to-Head Matchups in Anything at Anytime and Anywhere List, right behind the Floyd-Pacquiao fight and a trashcan-fire roadkill cook-off between Adam Richmond and Andrew Zimmerman. Please NBC Sports Network, you have nothing now that the Olympics are over. You even show the Olympics still. It’s kind of sad. I say you start hosting prize battles, between anyone, for anything. It will work, I swear. And plus, T.O. would host AND participate in every episode of the first season. It’d be amazing. You could convince him to Olive Oil Wrestle a Hippopotamus if you allowed him to host. Just say the hippo challenged T.O.’s driveway sit-up ability. I can’t think of a downside (except for the notion of T.O. being on TV again, but I must say: I miss him. So no, no downside). 8:37 p.m. — Arizona State is threatening, but by threatening I mean they’re standing across a metaphorical street with a party hat that they’re using as a megaphone, whispering in hushed tones about how they just might not invite Oregon to their neighborhood Christmas party. Too far? My bad. But they still didn’t score on 1st and Goal from the four. 8:41 p.m. — ASU turns it over on downs, but Oregon does the same. ASU should get it back inside Oregon territory. They do. But back to Oregon’s last drive. Bryan Bennett is a pretty awesome second option at QB. Sure he looks a little raw when he’s out there in mop up time, but Tom Brady would have a tough time staying 100 percent focused up 36 with less than a quarter to play. Have I mentioned that Oregon is deep? 8:54 p.m. — Of course. I’ll put that one half on me. Bryan Bennett throws the laziest, most stared-down pass this side of Taxi Driver and ASU’s Anthony Jones takes it 36-yards to the house. The good news for Oregon fans? If you bet the game, ASU wasn’t supposed to be as bad as Tennessee Tech, and Oregon is only laying seven. That touchdown? Didn’t matter at all. Unless you’re Bennett. Then you’re pissed. Oregon 43, Arizona State 14. 9:05 p.m. — So that touchdown was a perfect example of how exactly not to tackle. Michael Eubank has injected some life into this ASU offense, and they’ve capitalized by turning a WR Screen to DJ Foster into a 23-yard touchdown. Granted all of this is coming against Oregon’s softest defensive lineup possible, but still. The late electricity is at least making the box score appear close. And it’s bringing my prediction ever so close to fruition. Maybe not the exact count (38-21), but 43-21 is pretty damn close. If this holds, I’m alright with missing by five. Pushup score: Puddles 153, Sparky 42. Oregon 43, Arizona State 21. 9:10 p.m. — ASU recovers the onside kick (a beautifully executed play by kicker Alex Garoutte), which is promptly negated by an underthrown Michael Eubank pass that’s intercepted by Dior Mathis, Oregon’s fourth pick of the game. They now have 11 in the four games since conference play began. What does that mean? Besides the bringing on the second mass-exodus at Sun Devil Stadium, it means that the Ducks have been great at forcing turnovers, especially since conference play has started, which is even better news with USC looming just 17 days away. 9:19 p.m. — That’s it, that’s all folks. Trap game my patooter. Signing off from the comfort of Eugene, OR. Nelson, OUT. FINAL SCORE: Oregon 43, Arizona State 21. Kenjon Barner — 16 carries, 143 yards and 3 TDs. Signature play: A 71-yard run on Oregon’s first play from scrimmage to erase ASU’s early lead. Marcus Mariota — 9 of 12 for 46 yards and a TD; 10 carries for 135 yards and a TD; one reception for two yards and a TD. Signature Play: An 86-yard dash that broke the back of the ASU defense, and simultaneously made them look more bloated than Chip Kelly, post O.E.S. Oregon’s First Half Defense — The first unit held ASU’s vaunted offense, piloted by Taylor Kelly (formerly the fourth-most efficient passer in college football), to just 129 yards and forced two interceptions and four punts. ‹ GEORGE’S PICK: Oregon at Arizona St.